I never thought there would be a day! But now there are pictures for proof. I wore a crop top. And I loved it! I've been eyeing this top for a while with the pretty bright colors, scalloped bottom, and woven texture, and finally pulled the trigger. Many other bloggers I've seen look amazing in crop tops and show off very little skin. I tend to dress fairly modestly for a variety of reasons due to my comfort level, age, and because I work in the same community where I live-I don't need students or parents seeing me in revealing clothing! But many other bloggers I've seen look amazing in crop tops and show off very little skin. After measuring the length of this longer crop top, I thought I could make it work especially with my white higher waist jeans. Today I am feeling confident about a look I was scared to try, but feel like I am pulling off! Today Ada from Elegance and Mommyhood is co-hosting. 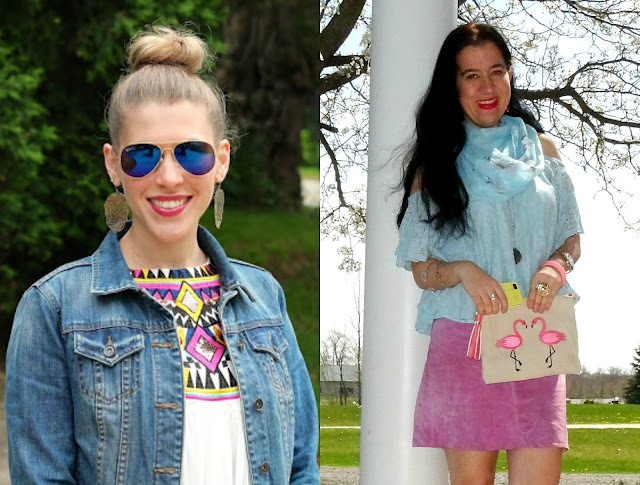 Ada is a veteran blogger and has a wealth of knowledge and clothing to draw from for lots of inspirational outfits. She also has a linkup on Thursdays called Thursday Moda so make sure you link up with her on Thursdays! You must go check out her blog and follow her if you don't already! I am loving this look on you Laura!! I personally love wearing crop tops since I'm petite and it has a lengthening affect and making your legs look mile long!! Love that you kept the rest of the look and accessories minimal. I have a few crop tops in ,y wardrobe but as I'm petite they aren't cropped on me at all haha. They just sit nicely on my hips! This top is gorgeous and it looks fabulous on you! I love it paired with the white shinny jeans and those rocking sandals! Really great look! Love this crop top the colors are so vibrant. I've seen that top everywhere on pinterest. love how you styled it! LOVE, love, LOVE that floral top!! You look like a sweet Summer Day!! I do not own a crop top, but I could see myself wearing this one... the colors and length are just right! Your curls look extra beautiful in these photos! You are definitely pulling off the crop top! Love this one. I wore them in my teens and twenties but have abandoned them since. I might pull it off with a longer one like this. What a cute top! I love the bright colors and scalloped hem! Very pretty top! It looks great with the higher waist jeans and isn't to revealing. Super lovely top and you look lovelier with that hairstyle Laura!!! Perfect crop top! I love the edges and the print, but I totally hear you on the showing too much skin and teaching. Adorable top! The bright floral is so pretty, as well as the scalloped hemline. You pulled off this look perfectly! That's awesome your wearing a crop top. Love it. Such a pretty pattern. I love your hair too! You are rocking this crop top Laura!! I love it on you and how you still make it look classy with just a hint of skin showing. Perfect with those white jeans. I love all of this prettiness! So perfect for summer! A couple things about this top---first...the print is so gorgeous so I don't even think you notice it's a crop top until further examination! Second--that's why high waisted jeans are good at times---ha ha! Besides you could wear a longer tank or lace extender under it if you needed coverage. I'm so in love with this shirt---darn you!! Your hair looks so amazing like this! Love that top! I love the way you're wearing this crop top! The top itself is so pretty and I love it paired with the high rise white jeans! 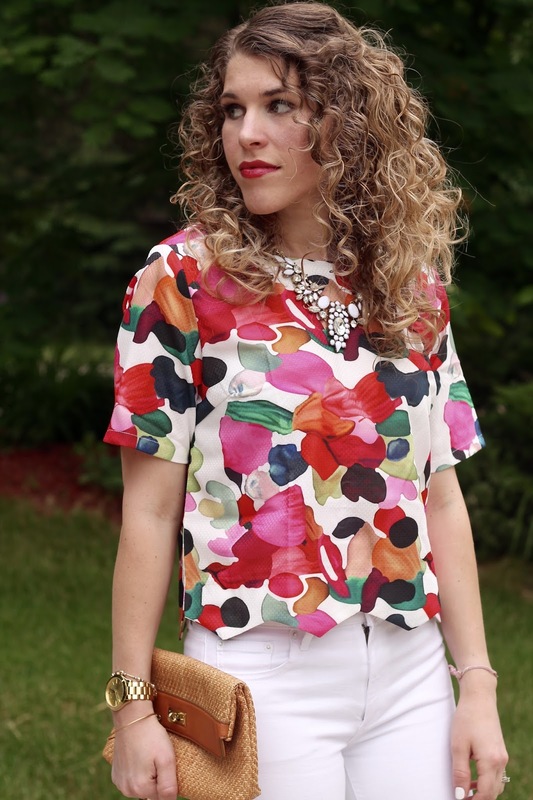 The floral cropped top is gorgeous and you couldn't have styled it any better. Love the clutch, watch and shoes too. This outfit is SO pretty! Even with it being a crop top you look classy, lady! I try to keep my outfits modest as well, and crop tops scare me a bit. I think you more than pulled the look off! The top is beautiful, and your white jeans look great with it. These jeans fit you so well and love it paired with the crop top. You look amazing!!!! Rocking that crop top! I have this same pair of white jeans, and they are my all time favorite! After shopping so many pairs, I loved the Gap the best. So perfect with your floral. Sooooo pretty, Laura! Love this look! Thanks for hosting. Beautiful top. I am glad you tried this trend as the crop top looks good on you. Love that outfit! Perfect for summer Laura!!! This crop is so colorful! Love it! The crop looks fun on you. I love the print and texture. This is one of my favorite looks on you! Those jeans fit you perfectly, and I love the cropped floral top! Beautiful Laura! So pretty! This is exactly how I would style a crop top too. Still the lengthening and fun cut, but modest. I love your curly hair too. Thanks for hosting! 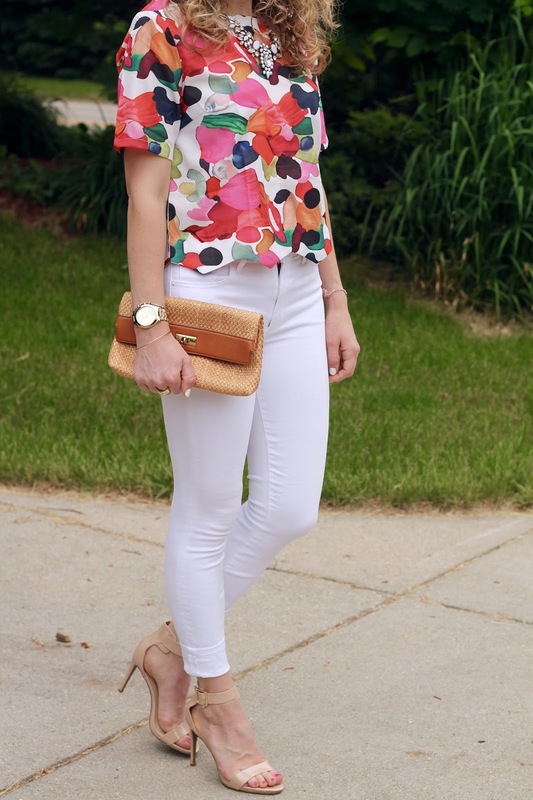 Love these bright colors and white jeans. So cute! I love it! You look gorgeous! I like how it does not show too much skin, but is still a crop! That floral top is just stunning on you! Looks great paired with those white pants! High waisted bottoms are perfect for crop tops. I love your floral crop top! Such a pretty top, paired with the white denim makes for the perfect summer look! Love the outfits! Not really sure how link ups work but can everyone check out my post on a behind the scenes look at a fashion show! You are definitely pulling it off! So beautiful on you! The crop looks stunning on you. I love that top on you! Gorgeous! My kind of crop top right here. GORGEOUS!! I love it. I think I've said it before Laura, but your hair is absolutely beautiful curly! Love the crop top. The print is gorgeous and it shows just the right amount of skin. Hi Laura! 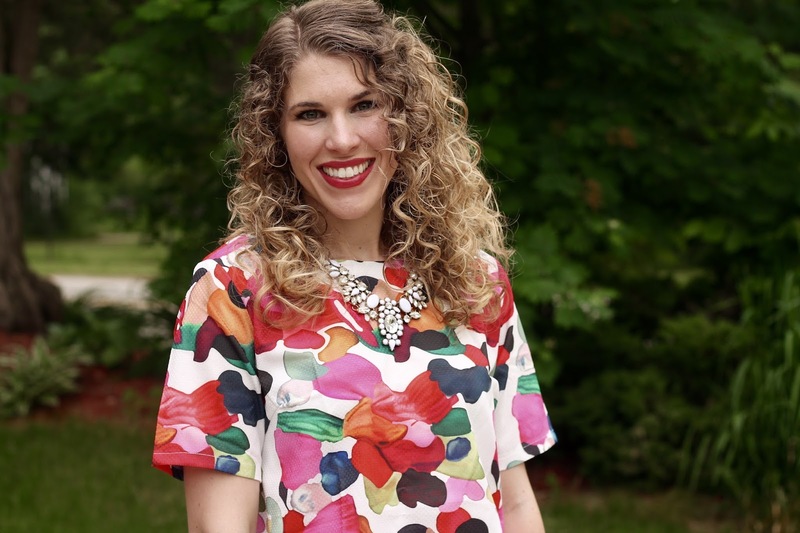 i LOVE florals, and this top is so pretty, bold bright colors looks like it was painted. The white jeans look great on you, and I feel I cant get enough white this season. Pretty look altogether! Love your crop top! Beautiful! And I love that crop tops work so well with high waisted jeans! That's the only way I can wear crops. And your hair is kind of amazing!! I ordered this same shirt from SheIn but the sizing was waaaayyyy off on their site. Whomp, whomp became this top is super cute!